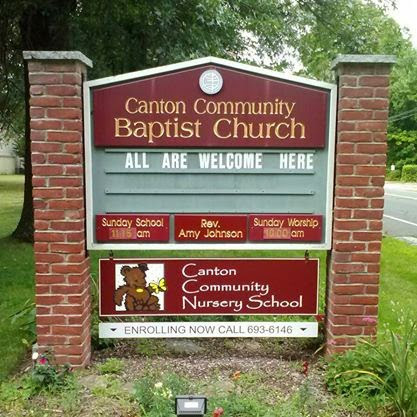 Welcome to the Canton Community Baptist Church website! CCBC is an American Baptist Church that has been serving God in the community since 1783. As a Christian church, we worship the Trinitarian God: Father/Creator, Son/Redeemer, and Holy Spirit/Sustainer. Our congregation welcomes all who seek to know God in community. When we say ALL ARE WELCOME, we mean it! You don't have to have answers about God or anything else. Come with questions and we will journey with you as you seek the answers God is preparing for you as a unique individual. God responds to each of us where we are and leads each of us to where we need to be. We believe in the "priesthood of all believers." This is the belief that each person is free to establish his or her own relationship with God and is responsible for doing so. We, as fellow disciples, endeavor to assist each other in our spiritual journeys. We avoid such titles as fundamentalist, liberal, evangelical, progressive, conservative, and so on, and enjoy a wide diversity of belief within our congregation. Indeed, we have a truly diverse congregation. In addition to a diversity of belief within our congregation, we have racial diversity, ethnic diversity, generational diversity, political diversity, and so on. Unity is, indeed, created out of diversity at CCBC! Our worship service begins at 10:00 a.m. It is mostly traditional, with a contemporary Christian singing group, familiar hymns, and Bible-based preaching that speaks to life as we live it in our time and place. Communion is served on the first Sunday of each month. We have Bible Study for adults, children, and youth beginning at 11:45 a.m.
We are a friendly congregation that shares fellowship, provides support in times of need, celebrates in times of abundance, and seeks to serve God in the world. We are a small church with a big heart, celebrating the loving community of God! ​We invite you to join us. "The Love of God is Broader than the Measures of our Minds"
In the description above of our church is the following quote: "We avoid such titles as fundamentalist, liberal, evangelical, progressive, conservative, and so on, and enjoy a wide diversity of belief within our congregation." The reason we avoid such titles is that we believe "there's a wideness in God's mercy. . . . For the love of God is broader than the measures of our minds, and the heart of the Eternal is most wonderfully kind." Join us to experience the infinite love and mercy of God! 04/18 – Maundy Thursday/Good Friday Candlelight Communion & Tennebrae Service, 6:30 p.m.
04/21 – Easter Breakfast, Easter Egg Hunt and Easter Worship Service, 8:45 a.m. In case of inclement weather, any cancellations will be listed on Channel 3, CBS, WFSB.